Firefighters will visit thousands of schools between October 9-15, educating students on fire safety. They will also make presentations on fire safety at home and in the work place. 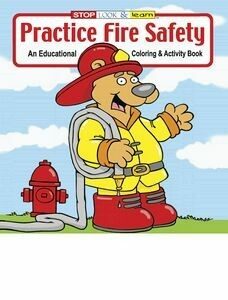 Coloring and activity books make great presentation aids and can be imprinted with sponsor information. If your company wants to become involved in community education, coloring books are a great, inexpensive way. 4 pack crayons are also available with or without an imprint. Coloring books are great for other events too! Any where there are children to entertain there is a marketing opportunity! Contact your promotional product representative for more information. Don’t have one, we can help. See our Contact Page for information.